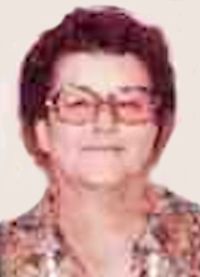 Obituary – Frick, Vera Lee (Campbell) « Perry High School Alumni Association, Inc.
Long time resident of Noble County, Vera Lee Frick, passed away January 1, 2010. She was born on December 12, 1926, the youngest of three children to Gladys (Swartz) and Mel Campbell. She went to Fairview County School Dist. #76 through the 8th grade, and then went on to Perry High School where she graduated on May 25, 1945. On October 10, 1945, she married Wilburn Lawrence Frick in Wellington, Kansas at the First Christian Parsonage. And to this union one child, a son, Billy Lynn Frick was born in the St. Agnes Hospital in Fresno, California on December 19, 1949. Since March 18, 1960, they have made their home 11 1/4 miles S.E. of Perry. She was a 4-H Club leader for many years, was a member of the Ladies of ’76 Farm Club, and also worked on the campus of Oklahoma State University for sixteen and a half years before retiring on February 22, 1988. Memorial services will be 11:00 a.m. Saturday, January 9, 2010 at the Brown-Dugger Funeral Home Chapel. There will be a private family burial at Grace Hill Cemetery in Perry, Oklahoma. She leaves behind her two grandchildren, Cheryl Ann Frick (Jenkins) of the home and William Lawrence Frick of Morrison, Oklahoma; her only great-granddaughter, Samanatha Dawn Frick also of the home; one sister, Letha Mae (Campbell) McGee and her husband, Olen, of Wichita, Kansas; one uncle, Raymond Lewis of Wichita, Kansas; numerous nieces, nephews, cousins and great nieces and nephews. She is preceded in death by her husband of 44 years, her only son, Billy Lynn Frick, her mother, Gladys Campbell, her father, Mel Campbell, her only brother, Clarence Campbell, one aunt, one uncle and one nephew.